Planning is underway for Lutefisk Sushi E, and we could use a couple more volunteers! If you want to be part of the planning process, come to our next meeting on Wednesday August 1, at 9pm at Altered Esthetics. If you can’t make the meeting, but still want to help, email me at lmcginty[at]alteredesthetics.org and I’ll give you something to do. Come Jam in Minneapolis Thursday August 2nd! 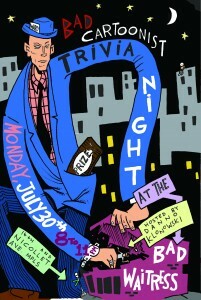 BAD CARTOONIST NIGHT @ The Bad Waitress is MONDAY, JULY 30th! 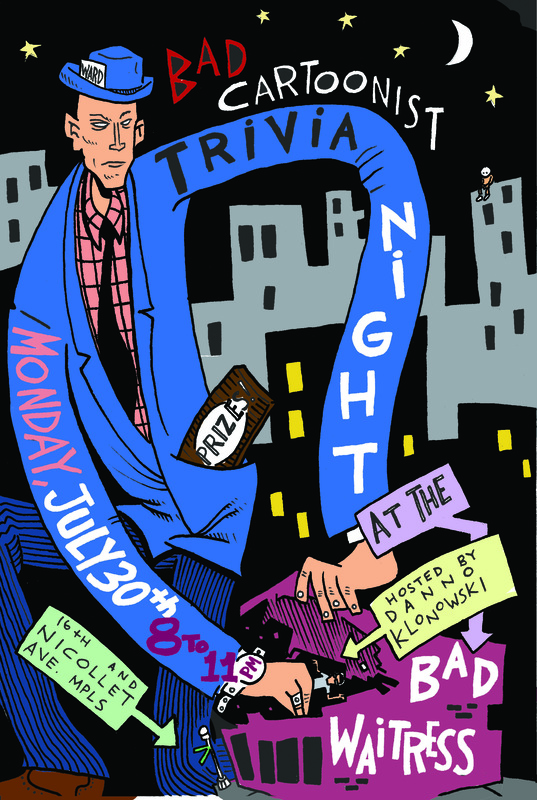 It’s the last Monday of the month, so it’s once again time for BAD CARTOONIST NIGHT at THE BAD WAITRESS!!! 8pm for food and 2-4-1 specials, table and countertop drawing, and some comic and pop culture-themed trivia (which starts at 9pm)! Awesome prizes to be won! 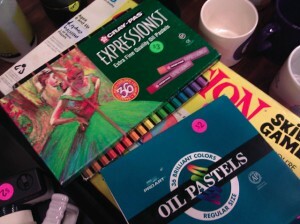 Awesome drawings to be made! The word awesome to be used in this sentence! Rain Taxi is launching a new Lit Art Magazine and wants YOU! Okay so recently Rain Taxi decided to launch a literary journal and is including COMICS! The deal is that on Aug 25th at the Cedar the event will launch with art making and local bands, and all the content for the issue will be made between noon and midnight, which is old hat for you comic jammers. They asked me to be the comics editor and I thought of you guys immediately. Who better to do this than 24 hour comics day veterans? The deal is though, that Rain Taxi is crowd funding the project in the style of Kickstarter. And the funding seems to be creeping so it is going to need all the help it can get to become a reality. The main reason that I am campaigning so much for this project among many other equally worthy projects is that I think it is a VERY IMPORTANT step in Minneapolis art/print scene that Rain Taxi from the get go decided to give COMICS an equal billing along with the more familiar short stories, poetry and non fiction. I think if this project makes it it will be another step towards comics being seen as an integral part of such anthologies and not an afterthought or oddity. Disclaimer: Ryuzine is still “beta” software and may aim to misbehave, but is receiving ongoing fixes and feature additions. Commercial use requires purchase of a small, one-time license per title. Funds go to support continued development and improvement of the webapp. It promises to be a great informative event! I have seen this program in action, and I think a lot of people would benefit from what Kristi has to share with us! Come on down before the jam at 6:00pm at Big Time Attic to check it out! Tomorrow is Altered Esthetics’ 4th annual Arty Garage Sale! Come find abandoned artwork, cheap supplies, household items, and more! Visit Ae’s website for more info. For the July 7000 BC meeting, Ben will be presenting a short workshop on using a tablet — a great opportunity for anybody who’s wondered about working on one, but never had the chance to try it out. We’ll also be making plans for upcoming conventions; the fall’s starting to fill up with events, so we’ll be looking for help. I’ve seen a few submissions and works-in-progress, and they look fantastic! Keep ’em coming, and let’s load up Mike’s inbox with great material! And as with all of these events, please spread the word to anyone you think might be interested! 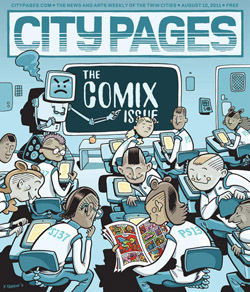 The CP Comix Issue is the one of the best tools we have to show people what a thriving indie cartooning scene we have here in the Twin Cities. The St paul jam will meet at Cahoots Coffee Bar (1562 Selby ave. St Paul ) on Thursday July 19 at 6;30. I ( Dave) will be there with paper and will be ready to draw.